The history of the Japanese people begins around the time of Christ in the last century BC when by which time they had migrated across from the mainland and were building a civilization on the Yamato Plain, the Buddhist influence coming in around five to six hundred years later. So Buddhism in Japan has about as long a history as Islam has in the Middle East, which means it is not as ancient as many seem to believe it is. A documentary titled “Lost Treasures Of The Ancient World: Episode 14 – Samurai Japan” looks at the time line of the history and is well worth watching. You’ll find it on YouTube if you click here. Japanese mythology tells us that Japan was created when two gods dipped a sword into the sea. Thus it is that the sword has become one of the three treasures of Japan. The sword that had been preserved as a part of the emperor’s imperial regalia representing the sword that was dipped into the sea was lost in the final battle of the Genpai War (1180–1185), a naval battle called the Battle of Dan-no-ura. 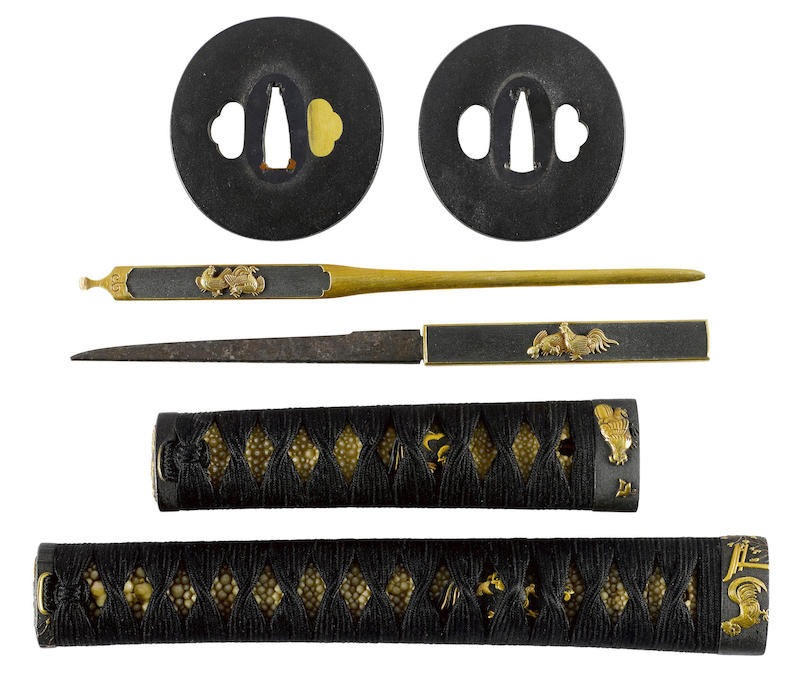 This is relevant to the two sets of Japanese sword koshirae (mountings) coming up for auction by Bonhams on 16th March 2016, as one set is decorated with imagery of the Genpai War. This set of daisho mountings here seen from the omote (outer) side features depictions of the Genpai War. (Picture courtesy Bonhams). The daisho became fashionable in and around the Edo period in Japan especially after the establishment of the Tokugawa Shogunate. Around that time only the samurai class were permitted to wear a long sword and only the samurai class were permitted to wear the long sword (daito) with a short sword (shoto), (“dai” meaning long, “sho” meaning short, and “to” meaning sword). The daisho was a badge of rank. 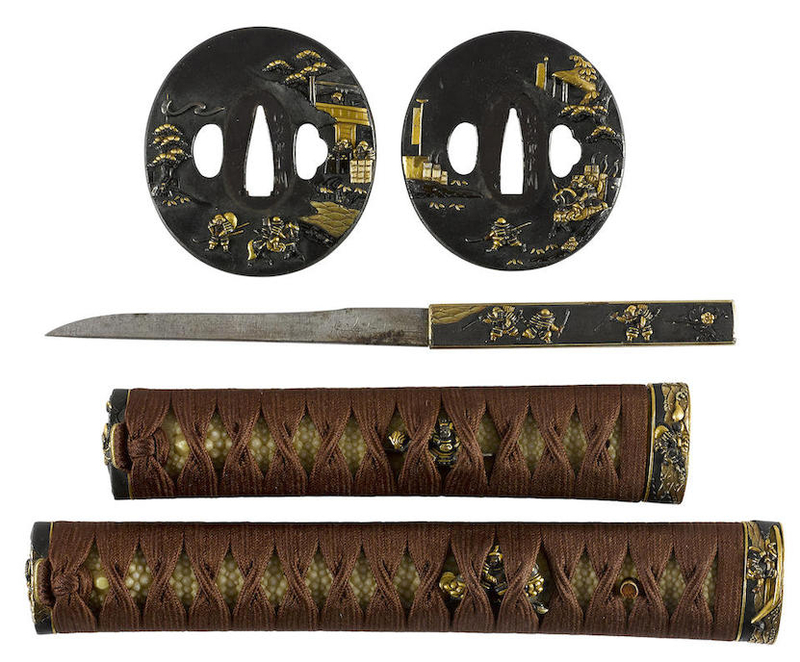 The scenes on the tsuba (hand guards), the small utility knife and on the tsuka (the hilts) feature scenes of warfare from the Genpai War. (Picture courtesy Bonhams). This set of daisho koshirae does not include actual sword blades. The term koshirae means mountings, so these daisho koshirae will most likely have wooden “blades” that support the fittings for display. With Tokubetsu Kicho (Especially Precious Sword Fitting) certificate no. 2940 issued by the Nihon Bijutsu Token Hozon Kyokai (Society for Preservation of Japanese Art Swords), dated March 23 1973. You will find this set of daisho koshirae on Bonhams auction page if you click here. The second set of daisho koshirae has decorations of chickens and seems to reflect a penchant for things agricultural. The next set of daisho koshirae is seen from the ura (inner) side. (Picture courtesy Bonhams). This set of koshirae is very attractive in its contrast of colours and the simplicity of the cast iron tsuba. (Picture courtesy Bonhams). tsuka wrapped in black silk, the katana goshirae mounted with shakudo nanako-ji fuchi-gashira with roosters, hens and chicks by a torii gate and young pines beneath a full moon in iroe taka-zogan, signed Hisahide (Kikugawa) and with a kao; the wakizashi goshirae mounted with shaukdo nanako-ji fuchi-gashira decorated with roosters, hens and chicks in gold takazogan, signed Yoshiharu (Kuwamura) and with a kao, and a kozuka and kogai decorated to match, each koshirae with an oval shakudo plate tsuba finished in a “crepe” pattern. With Tokubetsu Hozon Tosogu (Sword Fitting Especially Worthy of Preservation) certificate no. 2001131 issued by the Nihon Bijutsu Token Hozon Kyokai (Society for Preservation of Japanese Art Swords), dated June 27 2013. These sets of koshirae are certified by the Nihon Bijutsu Token Hozon Kyokai (Society for Preservation of Japanese Art Swords) and are thus prioritized for preservation as important art objects. For the Japanese the sword, and all that pertains to it including the fittings and the arts associated with the making of the sword blade, polishing of the sword blade and use of the sword are important both culturally and for art’s sake. The NBTHK holds annual competitions for Japan’s current generation of sword-smiths and these events are held to be greatly important. The sword is one of the three treasures of Japan and the Japanese have made every aspect of the sword into an art form.